The Colorado Convention center probably has one of the most unique piece of art you will ever see – a big blue bear peering inside the center. 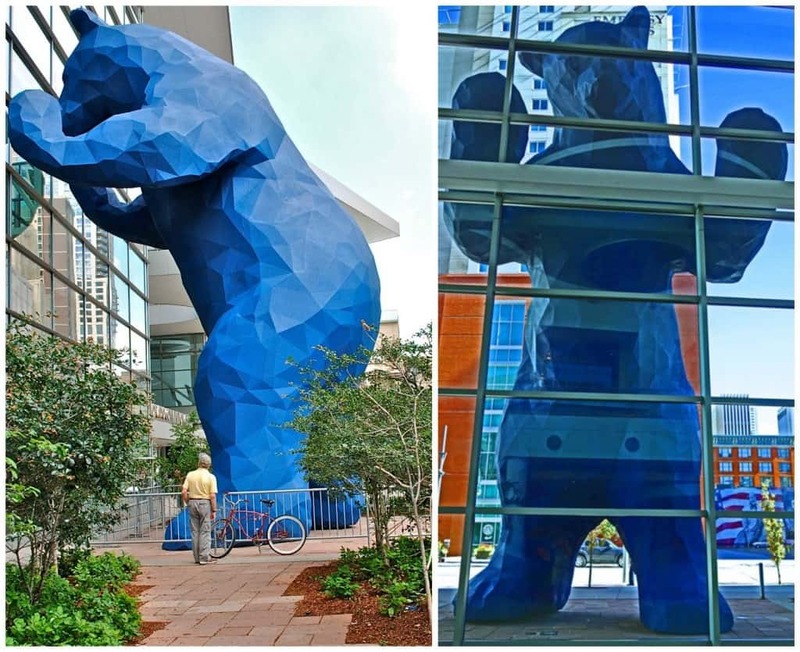 The 40-feet high bear was installed in 2005 by Lawrence Argent and the idea for the curious beer came from the artist’s own curiosity of what goes on inside the convention center. 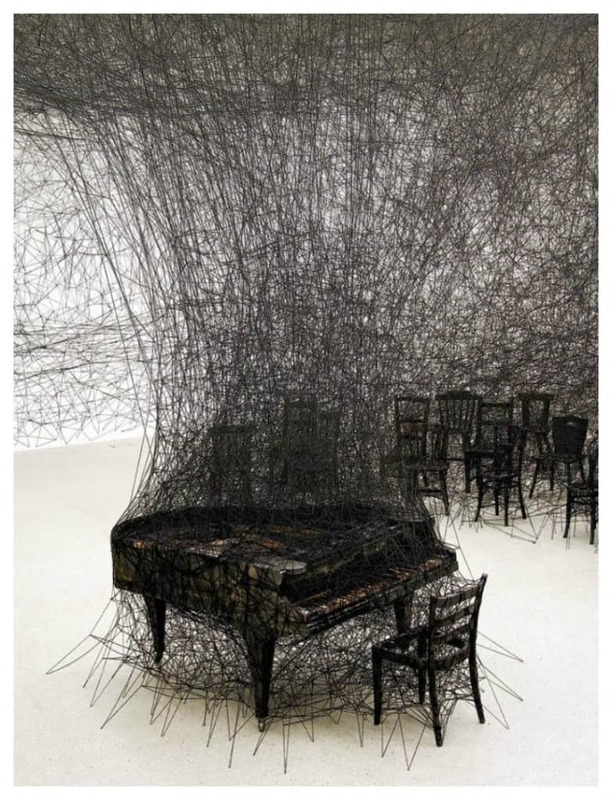 In 2012, Sicilian artist Giuseppe Licari showcased a variety of prickly tree roots hanging from the ceiling like organic chandeliers. He titled the work ‘humus,’ which refers to the soil layer that is needed for the growth of trees. 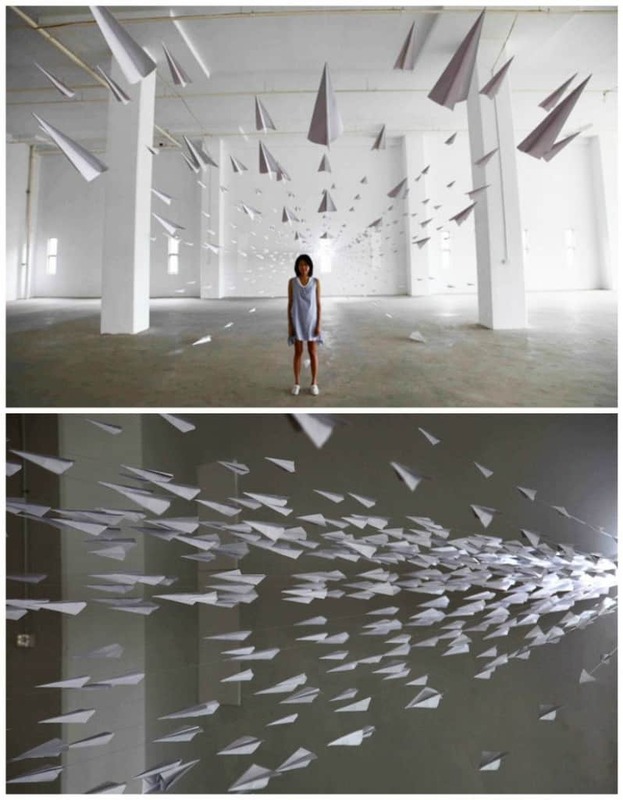 The installation was meant to portray the underbelly of a forest. 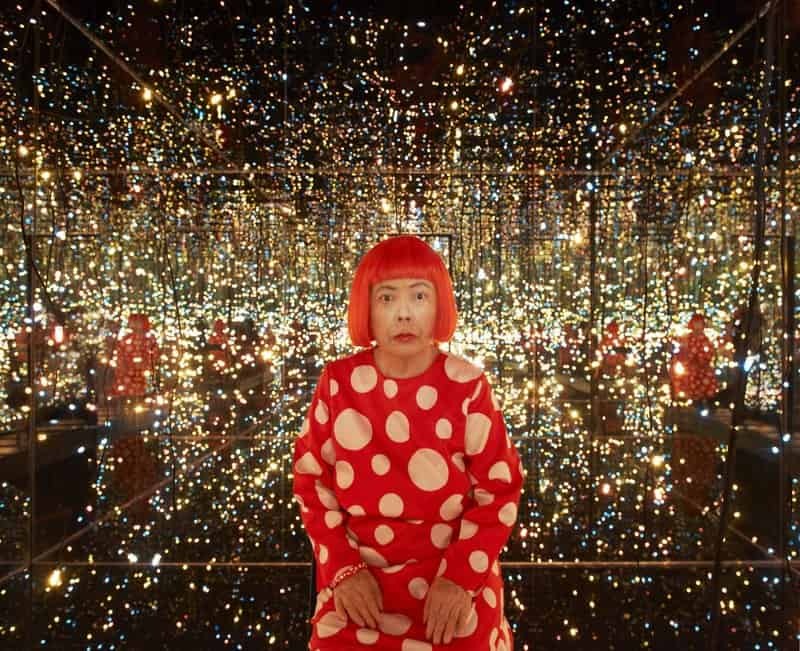 Aptly titled ‘fireflies on the water’, this beautiful art installation by Yayoi Kusama was created in a small, darkened room lined with mirrors on all sides. There was a pool of water in the center of the space along with a dock-like viewing platform. From the ceiling hung 150 small lights. In tandem, all the components created a dazzling effect of direct and reflected light, emanating from all the mirrors and the water’s surface. 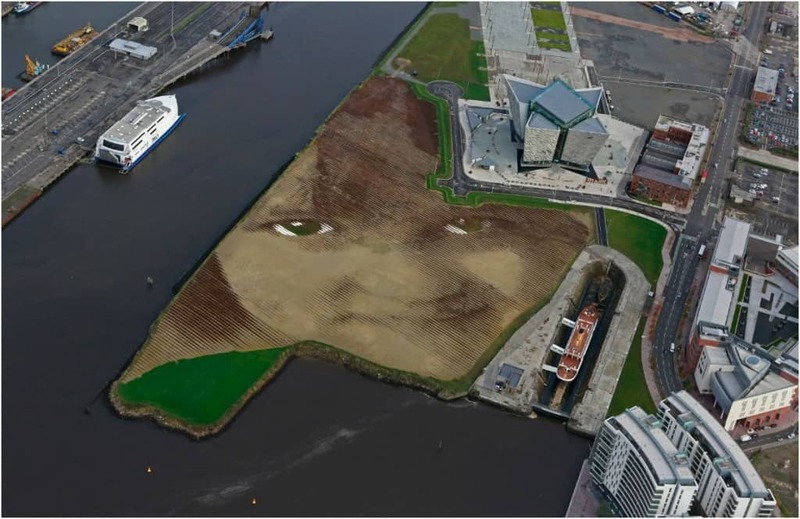 The work was displayed in 2002 and had to be viewed in solitude – one person at a time – as per the artist’s instructions. 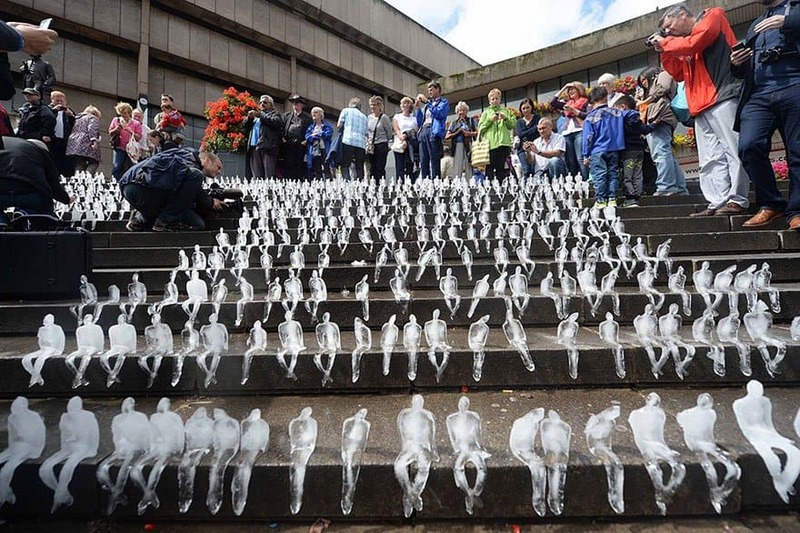 The artwork featured 1000 ice sculptures of men sitting on public steps in Berlin while literally melting away in the sun. The work spotlighted the WWF’s warning that the warming of the Arctic will change the weather in different parts of the world and will increase the release of greenhouse gases into the atmosphere. This fun and awesomely creative artwork looks like a house with men and woman hanging out of the windows and off its ledges thanks to their spider like reflexes. 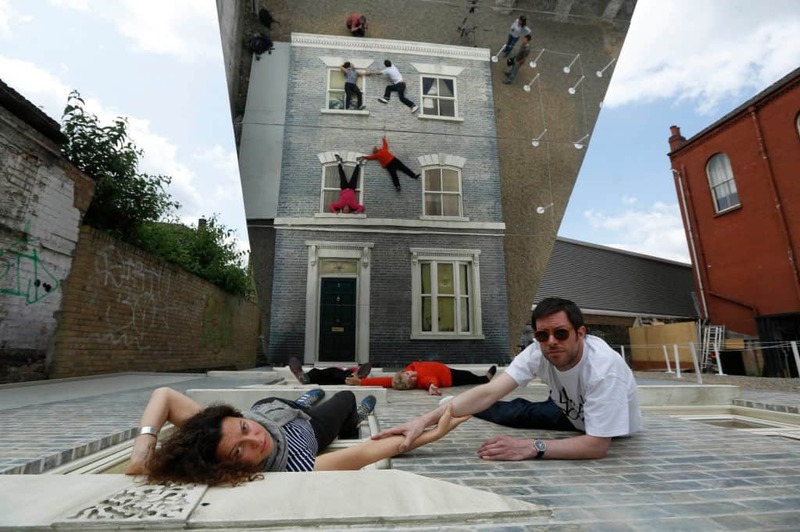 In actuality however, the Victorian terraced house had a mirrored surface positioned overhead at a 45-degree angle, which created the illusion of people climbing walls like modern day superheros. In 2007, Damian Ortega’s piece titled ‘controller of the universe’ featured a variety of free-floating tools suspended in mid-air. The artist’s particular arrangement of tools were made to resemble objects propelled outwards from an invisible center into the surrounding space. 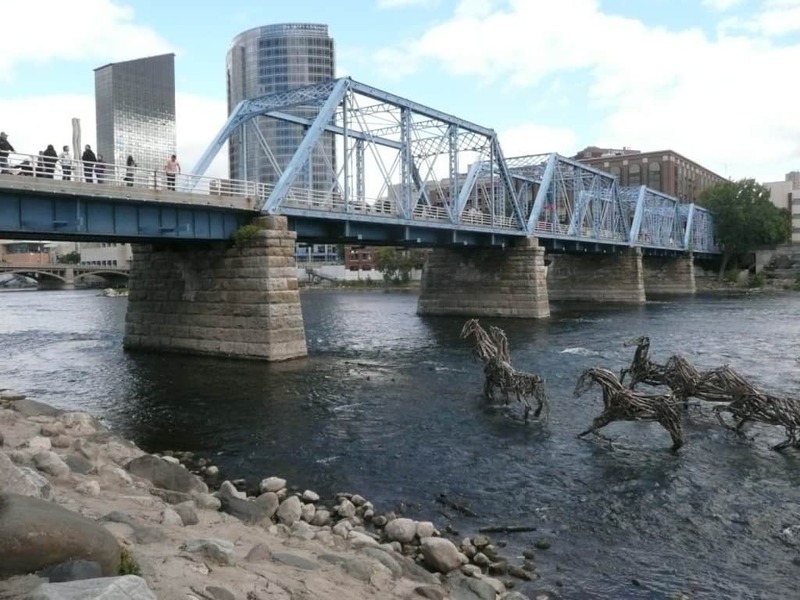 Artist Richard Morse used this visual representation of horses running through a river to symbolize the struggles and perseverance, along with the grace and powerful attitude that everybody needs in difficult situations. Allowing his own life to depict his art, after battling stage-4 cancer, the artist used fallen branches to illustrate the struggle that horse’s must face, as they step into the unknown, under the water’s surface. 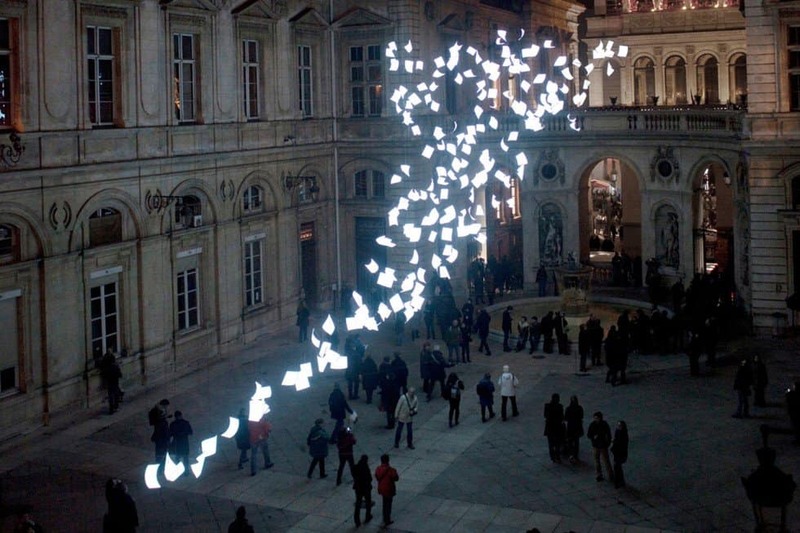 In 2011, London designer Paul Cocksedge created a beautiful piece of art resembling glowing pieces of paper soaring in the wind for the Festival of Lights in France. It was Installed in the courtyard of Hotel de Ville, the 25-metre-long Bourrasque sculpture, comprised of 200 sheets of paper made from an electrically conductive material that lights up when current passes through it. 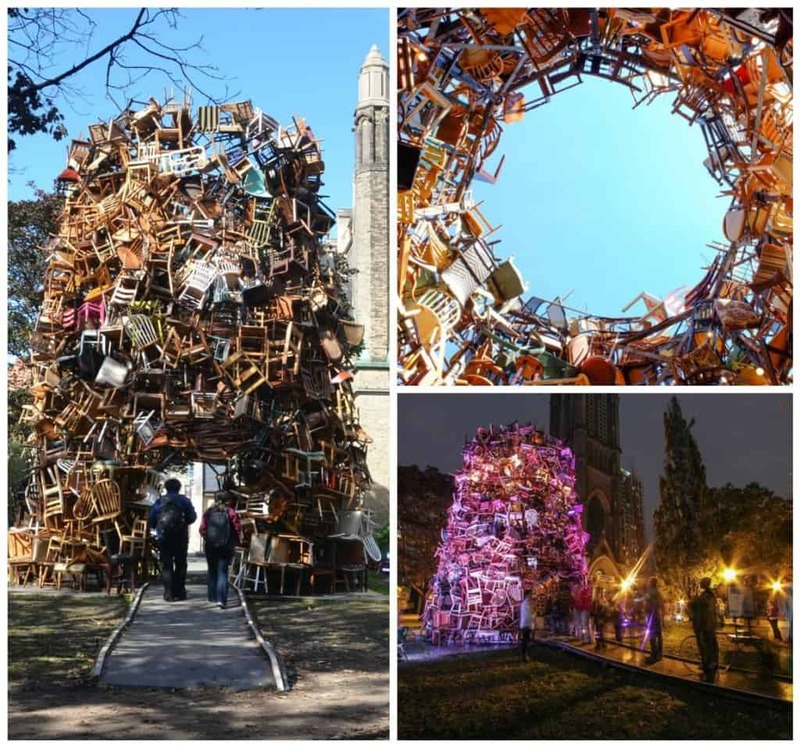 In 2013, Japanese artist Tadashi Kawamata created a unique art installation titled ‘Garden Towers’ in the front yard of the Metropolitan United Church, in Toronto. The chaotic arrangement of hundreds of wooden chairs, benches and garden furniture were stacked on top of each other to form an amphitheater. This piece by Anaisa Franco was built on a bridge at the Hangzhou Xixi National Wetland Park in China. 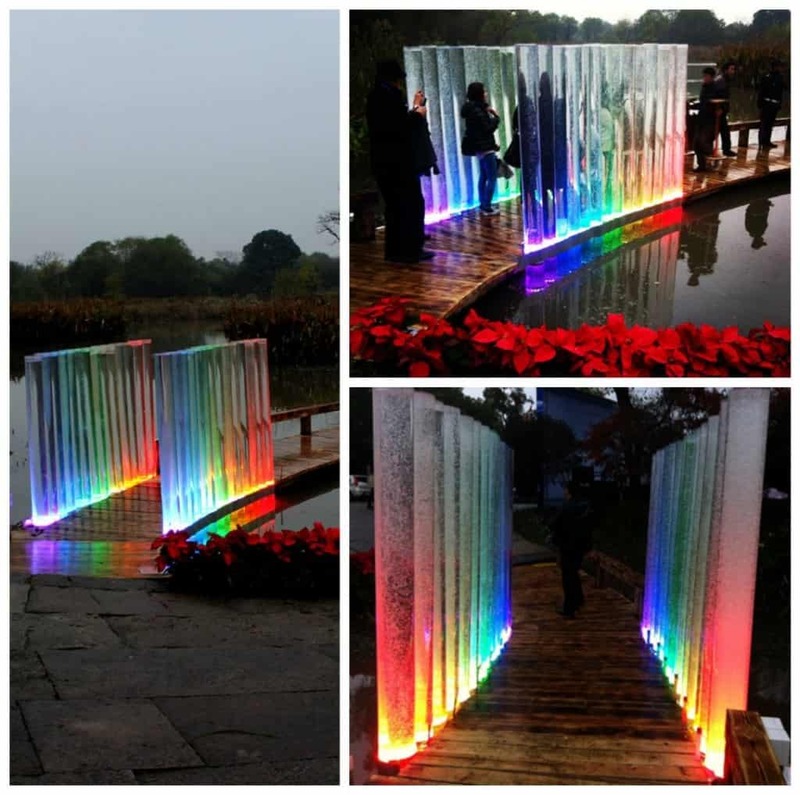 The installation is made up of 28 acrylic tubes, each filled with water, sensors, air pumps, and LED lights representing the seven main colors in the rainbow. 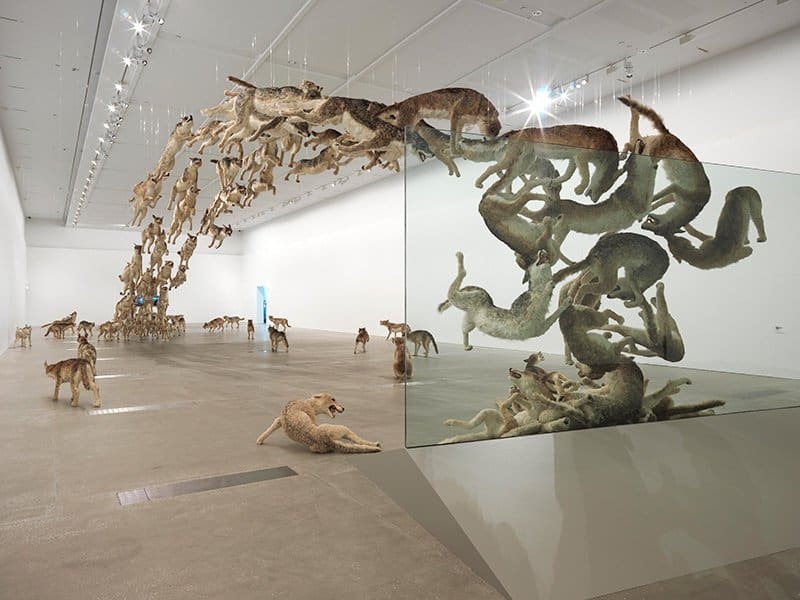 In 2013 Cai Guo Giang channeled his fascination with animals into an amazing piece of artwork titled ‘heritage,’ which was inspired by his trip to Australia in 2011. 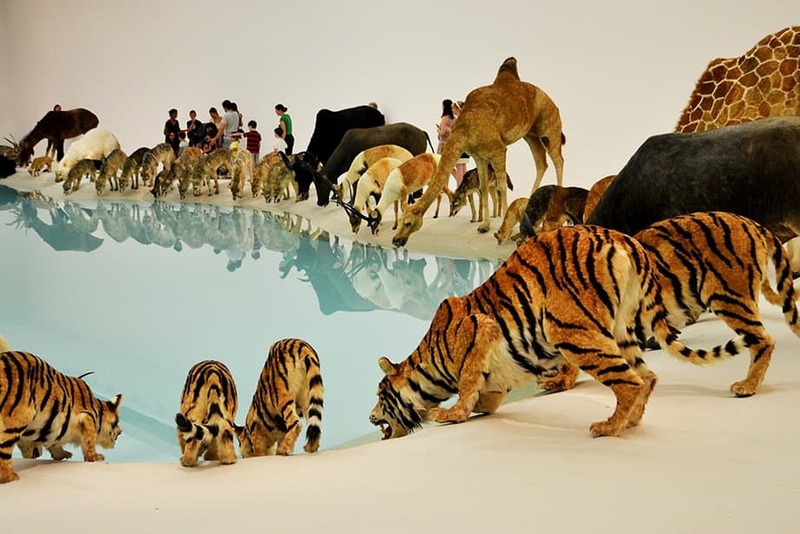 Heritage featured 99 replicas of animals from around the world simultaneously drinking from a lake surrounded by pristine white sands.